You’ll particularly enjoy staying here if you plan to discover Prague’s old town. The spacious and comfortable living space will be great to come back to after you’ve sampled the local bars. And we particularly like the funky design and high ceilings. If you’re coming with a larger group, there are other apartments on offer in the same building. Good King Wenceslas may have looked out onto a field of snow, but these days his namesake square in the ‘New Town’ boasts the National Museum, grand hotels, shops, cafes and bags of mid-town buzz. After clueing up on the Czech culture at the National Museum and Museum of Communism and viewing the district’s trove of gorgeous churches, make you way the river to see the Dancing House, an extraordinary ‘twisted’ building by architect Frank Gehry. Who said Prague was a stickler for tradition? Wonderful apartment, absolutely suites for 6 people.Perfect location. You don't need public transport at all. The included ride from the airport and being met for check in are wonderful bonuses. The unit was immaculate, beds are comfortable. The price was wonderfully inexpensive. Location is ideal. Only small wish would be for nicer towels. Great location and wonderful people! We were 7 adults who stayed a week in Prague - the apartment was perfect - great location for exploring the city with access to everything we needed. One of our group had a friend who is a life time resident of Prague and was surprised we were able to find an apartment of this size in such a great location. The greeter met us the first day and gave us a great tour of the apartment and information we needed about the surrounding area. He was available to answer questions by phone when we had them. Also, he responded very quickly when contacted by WhatsApp. The apartment has two full bathrooms and a powder room. Three of the four bedrooms are quite large. The bedroom with two twin beds is small but adequate. The kitchen is fully stocked and has both a large and a small refrigerator. Most of all, the apartment was very quiet and is on the top floor (6th). You can reach the apartment by elevator or walk the 136 steps up to the apartment (good workout). I would recommend this apartment without hesitation and would stay here when I returned to Prague. Our family had a wonderful time staying in this apartment. The 4 bedrooms provided more than enough room for the six of us - and could comfortably fit more! The rooms are a good size with a couch (although the room with the two single beds is a bit tighter). It's a nice living room with plenty of room to relax. There was a small elevator to get to the 6th floor. And the air conditioning did a good job keeping the place cool during the hot spell while we were there. 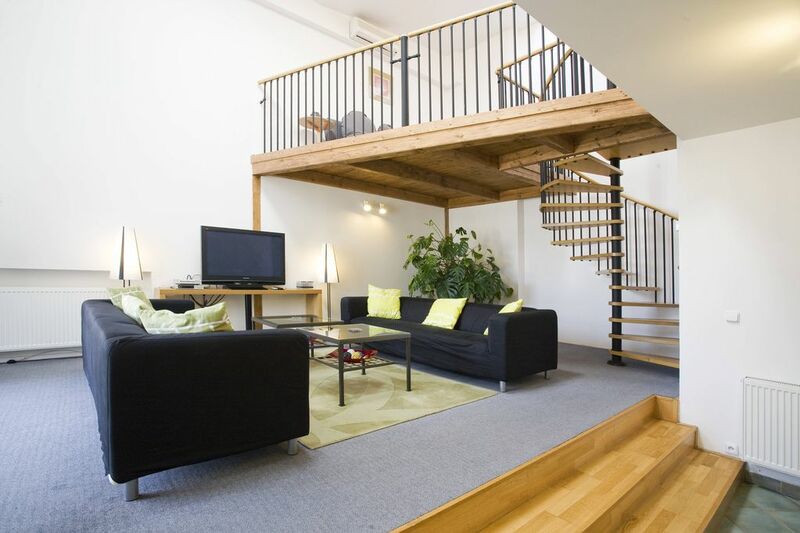 And the location is excellent - right by Wenceslas Square with a subway stop and tram stop just a very short walk away. And there is a large grocery store even closer (basement of the near-by mall). Plus some good places to eat if you don't want to go far - like the place right by the Kafka statue. However, we often just chose to set off walking to where ever we wanted to go. It's an easy walk to Old Town Square. I would definitely recommend this apartment to others - and the support we received from the apartment manager was great too!